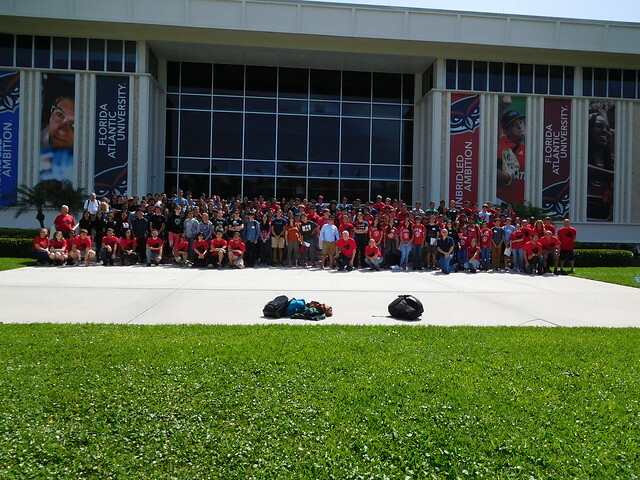 The fourteenth annual FAU Math Day was held on Saturday, January 27, 2018, on the Boca Raton campus of Florida Atlantic University. We hope everybody had a good time. We want to thank all participants, students, teachers, coaches, and parents. Special thanks go to Ms. Elke Boyes, the Regional Branch Manager of Wells Fargo, without whose support the event would not have been possible, to Dean Ata Saradjedini of the College of Science, whose support and encouragement is also very important to us, and to our speaker, Dr. Katarzyna Winkowska-Nowak who talked about Inquiry Learning with Geogebra and above all to our wonderful keynote speaker, Dr. Erika Camacho. An eminent physicist, Eugene Wigner (Nobel Prize in Physics, 1963) once wondered about the "unreasonable effectiveness of mathematics in the natural sciences," how is it possible that mathematics is so good in describing natural phenomena? The most amazing thing is that many of the mathematical tools developed to study nature, the models set up, are continuous models; however, nature is discrete. Professor Camacho illustrated this well by showing a number of such models applied to discrete situations. She also wowed the audience with the story of her life; certainly an incredible role model for everybody. Many thanks are also due to the many members of the Department of Mathematical Sciences, students, faculty, and staff, who sacrificed part of their Saturday to help out. or call Dr. Tomas Schonbek at (561) 297-3355. Suggestions from teachers, especially from those who attended previous Math Days, are particularly welcome. Florida Atlantic University serves over 30,000 undergraduates, and 5,000 graduate and professional students in a rapidly expanding urban environment with the main campus located three miles from the Atlantic Ocean, on an 850-acre site in Boca Raton. The department of mathematical sciences offers the degrees BA, BS, MS, MS in Applied Mathematics and Statistics, MS in Teaching, and Ph.D. in Mathematics. There are 35 faculty members in the department, most of them actively engaged in research in areas that range from the purely classical to cutting-edge applications in biomathematics and communications security. Students graduating from the department have the option of pursuing careers in teaching, in industry, or continue their mathematical education by enrolling in a graduate program, either at FAU or elsewhere. For qualified students, the department offers a combined BS-MS program. Math Day 2017 is made possible through the very generous underwriting sponsorship of Wells Fargo Bank. Math Day is organized by Tomas Schonbek, Erik Lundberg, Emily Cimillo, and Sonia Kimbrough. However, it would not be possible without the enthusiastic and indispensable support received from the Charles E. Schmidt College of Science, the Center for Cryptology and Information Security, the staff, faculty, and students of the Department of Mathematical Sciences, and last, but definitely not least, from all the hard working high school mathematics teachers in Broward, Palm Beach, Dade, and Martin counties.